The City will hold a 9-11 ceremony on Friday, September 9, from 8:30-9 a.m. at the Dewey Brown Plaza, across the street from City Hall. City Hall will be temporarily closed starting at 8:30 a.m. and will re-open again at 9 a.m. after the ceremony. 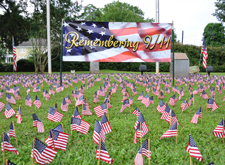 The City will observe the 15th anniversary of the September 11, 2001, terrorist attack on the United States, a day that 2,977 innocent victims lost their lives. Please take a moment to join in remembering the victims, and honoring their families and the heroes who came forward during the rescue efforts in the days and weeks that followed. A commemorative display featuring hundreds of miniature American flags has been placed at the Dewey Brown Plaza across the street from City Hall.